I have a custom made subwoofer box that is brand new and was made to fit the back cargo area of my traded in 2004 Ford Expedition. This box was custom made so that it could fit behind the third row seats when up or in the cargo area if the third row is down or not installed. Although this box was made specifically for a Ford Expedition, I checked if it was compatible to other large SUV type vehicles, it fit beautifully in a Tahoe and a Lincoln. However, please check specs below if you are unsure. 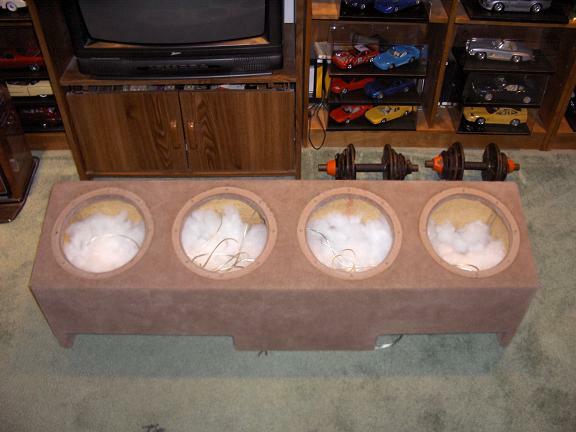 The box is carpeted in standard beige, and it is split into two sections, and fits 4 - 10 inch subs. The dimensions for this box are: 49.5 inches long, 15 inches wide, with 2 foot by 2 foot of airspace. The wires are already enclosed, and the box is filled half way with polyphil for optimum sound quality. This item is located in Broomall, PA in the Philadelphia area. The box is available for local pickup and despite its size, I also can have this shipped nationwide due to a friend who works for a commercial shipping company. If you have any questions feel free to call me or email me. EASILY RECARPETED TO MATCH YOUR CAR, THIS COST ME $500 NEW, COMPARED TO RETAIL PRICES YOU WILL PAY HUNDREDS FOR LIKE QUALITY OR EVEN LESSER QUALITY BOX. CONTACT ME, MY MAIN GOAL IS THAT THIS NOT GO TO WASTE SITTING IN STORAGE. MAKE ME ANY OFFER WHY PAY MORE OR DO IT YOURSELF THIS IS A PROFESSIONALLY BUILT CUSTOM SUB BOX!